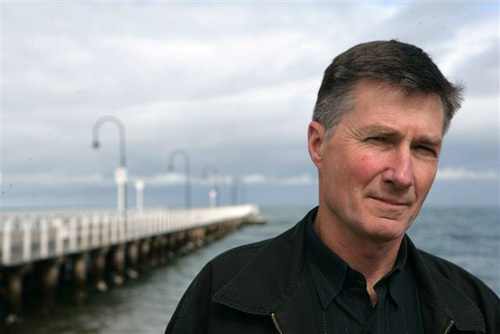 Last night at an event at the Melbourne Writers' Festival, prolific Australian author Garry Disher came out on top at the 15th annual Ned Kelly Awards, with his crime thriller WYATT picking up the 2010 award for Best Novel (hat tip to Kerrie from Mysteries in Paradise for the heads-up). It was the second Ned Kelly for Disher, who won in 2007 for CHAIN OF EVIDENCE. As noted today in an article in the Melbourne Age reporting on Disher's Ned Kelly win last night, in WYATT Disher brings back his titular anti-hero, a "cool and very calculating crim" who starred in six books in the early to mid 1990s. 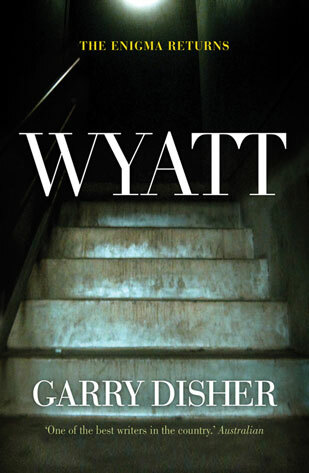 As the Age said, "If Disher, who has published 41 books in a variety of genres, had any doubts about revivifying Wyatt's life of crime, they were put to rest last night when WYATT won the Ned Kelly award for the past year's best Australian crime novel." You can read that full article, including some comment from Disher, here. Disher, who was born on a farm in South Australia, has certainly written a lot of different kinds of books; literary and general adult fiction, short stories, adult crime and thriller fiction, young adult fiction, children's fiction, and Australian history textbooks for schools, amongst other things. I had heard of Disher, but didn't know much about him, and hadn't yet read any of his books - so I thought I'd take this opportunity to do a little bit of quick research and share it with you all (since many Crime Watch readers may be in a similar situation). According to his website, many of Disher's "children's and Young Adult titles continue to be studied in schools", and his "crime novels are rapidly earning an international reputation, with editions published in the USA, England, Germany, Holland, Denmark, Italy, Spain and Hungary." He's also won crime fiction awards in Germany. In something that may be interesting for some of you, Disher also shares some of his thoughts on writing crime fiction (covering topics like finding and developing ideas, theme, and planning etc) on his website, which you can read here. The publisher's blurb for WYATT says, "The job’s a jewel heist. The kind Wyatt likes. Nothing extravagant, nothing greedy. Stake out the international courier, one Alain Le Page, hold up the goods in transit and get away fast. Wyatt prefers to work alone, but this is Eddie Oberin’s job. Eddie’s very smart ex-wife Lydia has the inside information. Add Wyatt’s planning genius and meticulous preparation, and what could possibly go wrong? Plenty. And when you wrong Wyatt, you don’t get to just walk away." Immediate reaction on the blogosphere to Disher's win has been mixed, with several reviewers seeming to have struggled with the book. I haven't read it yet, so can't comment. Book Show reviewer Chris Flynn, who's also editor of Torpedo magazine, reviews the book for ABC radio. Listen here. Karen Chisholm, creator of AustCrimeFiction.org, reviews the book on CrimeSpace. Max Oliver of Bookseller+Publisher magazine shares his review on FancyGoods.com.au. Stephen Davenport of The Independent Weekly newspaper. Sally Murphy reviews the book on AussieReviews.com. On the three-book shortlist, WYATT was up against BLEED FOR ME from twice Ned Kelly winner Michael Robotham, and THE BLACK RUSSIAN by Lenny Bartulin. For those wondering where Peter Temple's TRUTH was, and how a crime thriller that won the Miles Franklin Award, and has been said by many should have been on the Booker Prize list, failed to make the shortlist, I understand TRUTH was withdrawn from Ned Kelly consideration (perhaps at the request of the author or publisher, I'm not sure) after being noted on the original longlist. Personally, I would have liked to see Robotham win, as I enjoyed BLEED FOR ME, and he is coming to New Zealand next week for The Press Christchurch Writers Festival (assuming that all goes ahead after the massive 7.1 earthquake there this morning), and will be there on the night of our own inaugural Ngaio Marsh Award for Best Crime Novel. But Robotham did tell me during our recent interview that he thought WYATT might win the Ned Kelly. So, have you read WYATT? Or any of Garry Disher's other crime novels? What do you think of the Ned Kelly Awards, or crime fiction awards in general? Have you tried some Australian crime fiction lately? Who are your favourite Australian crime writers? Thoughts and comments welcome. I too would have liked to see MR win Criag, but Disher is also a worthy recipient. I haven't read Wyatt (though I have a publisher copy), and from what I've read about that series I am not that keen as I don't like "diamond heist" or "Raffles" style novels. There is a positive review on Aust Crime but that did not convince me as it says that the book is all about the details of the crime planning, etc. I guess I just don't sympathise with criminals and am not that interested in reading about them (particularly if they are cast sympathetically). However, I did recently read the first in the author's other series, Dragon Man. They are police procedurals featuring Hal Challis and Ellen Destry, and I can certainly recommend the first. I've bought the second, in fact, Kittyhawk Down. Craig-- Temple himself scratched the book from consideration. I loved WYATT and THE BLACK RUSSIAN is also fantastic. shoot me an email if you're keen, we have some crazy exciting stuff upcoming.